What are the dimensions of the cornea? The cornea is the transparent disk-like anterior portion of the eye, and in the adult typically measures 10.5 mm from top to bottom and 11.5 mm from side to side. Centrally the cornea is about 500 microns (515-539) in thickness and peripherally it is about 650 microns thick. The cornea is more curved than the eye and protrudes anteriorly. 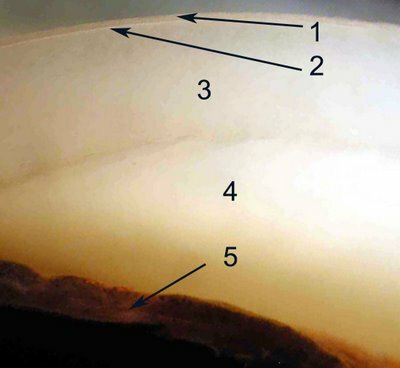 The cornea has five layers. How many layers does the corneal epithelium have? 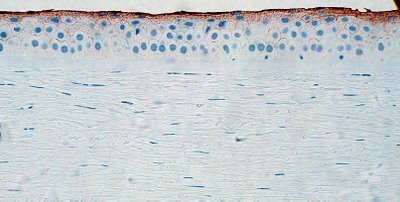 The non-keratinizing squamous epithelium with a basal cell layer gives rise to five to six superficial layers with a total thickness of about 50 µm. What nerves innervate the cornea and how anterior do they course? Numerous free nerve endings terminate in this epithelium and are the afferent part of the blink (ciliary) reflex, which is mediated mainly through the sensory part of the fifth cranial nerve (V1). The nerves generally arise from the long posterior ciliary nerves although some come from conjunctival and episcleral origins. At the ora serrata the nerves branch to distribute all about the limbus. Most studies indicate that the nerves are mainly present in the anterior two-thirds of the cornea and that Descemet's membrane is bereft of innervation. The nerves that enter at the limbus, lose their perineuria as well as myelin sheaths, and advance more radially toward the cornea center in the stroma. The sub-epithelial or sub-basal plexus is particularly dense with innervation. The nerve send branches at 90 degree angles toward the surface and penetrate Bowman's layer. The nerves completely lose their myelin sheaths as they penetrate Bowman's layer. The nerves penetrate up to 2 cell layers from the surface (near the superficial cells). One can imagine that an oblique flap made at 100 microns in the depth of the cornea (as in LASIK) would transect the corneal nerves in the field! Name the cell layers of the corneal epithelium? 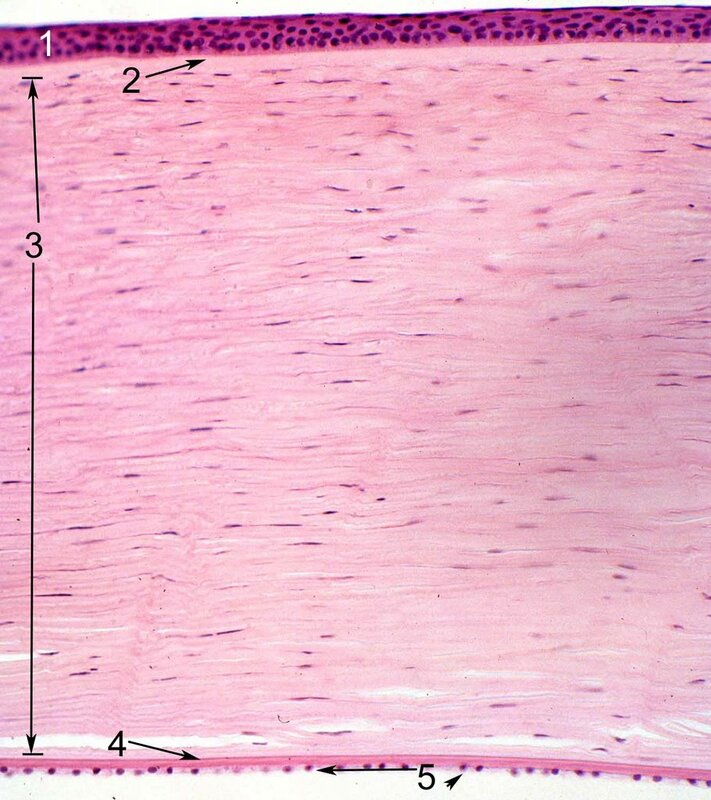 The basal layer is composed of a single layer of cuboidal to columnar cells (~ 18 μ in height). Above the basal cell layer are 2 layers of wing cells (shaped like a wing) . Beyond this layer two superficial cells become more flattened and more dense with some loss of cell organelles. What is the nature of the specialized corneal surface? The surface or superficial cells have glycogen granules as well as a thick outer membrane (100 angstroms) that is PAS positive. The surface glycocalyx is composed of transmembrane mucins, MUC1 and MUC16 that emanate from the surface. 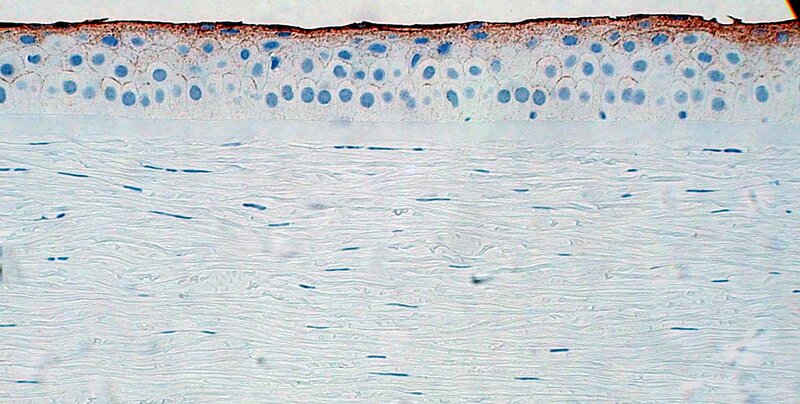 (Ref and those within) In the image below the brown areas represent immunohistochemical staining to the superficial corneal epithelium (normally about 2 layers) by antibodies to the 0-linked mucin called MUC 16. The surface cells are covered by a microvillous/microplical surface, interconnected undulations that measure about .5 microns in thickness and height and 1-3 microns in length, not visible in this photograph. What is the composition of Bowman's layer? Bowman's layer is composed of fine collagen fibrils and is about 10 µm thick. The layer is acellular. Bowman's layer is limited anteriorly by the basement membrane of the corneal epithelium. The layer is composed of collagen fibrils arranged in random distribution. Where Bowman's layer joins underlying lamellar stroma, there is a transition zone from collagen fibrils that are obliquely arranged to collagenous lamellae of the superficial corneal stroma. Bowman's layer is rarely seen at the slit lamp and only by the most experienced observers. 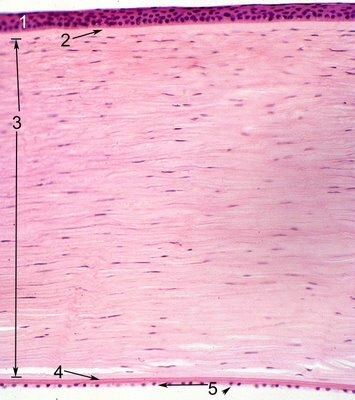 However with appropriate lighting Bowman's layer is quite visible under the dissecting microscope (arrow 2 in the Figure below). Number 3 is on the corneal stroma, 4 is in the anterior chamber and arrow 5 points to the iris. What is the composition of the corneal stroma? The main layer of the cornea is composed of 60-70 successive layers (lamellae of obliquely oriented tightly bound, collagen fibers (corneal lamellae) embedded in an extracellular matrix composed mainly of sulfated glycosaminoglycans. To provide maximum mechanical strength the direction of the collagen fibers differs in each layer. Between the lamellae are sparse fibrocytes (keratocytes). Does the normal cornea have blood vessels? There are no blood vessels in the cornea; the regular parallel arrangement of the collagen and the paucity of cells render the cornea translucent and allow it to transmit light. Why is the cornea clear? The cornea is composed of collagen. Collagen in the body is usually opaque. Because the corneal fibrils form a sort of 3 dimensional array of diffraction gratings lamellae, scattered light is eliminated by destructive interference. The fibrils however must be separated from each other by less than ½ of a wavelength of light to remain transparent. Hence the irregularity of Bowman’s layer can be compensated by this arrangement. Corneal edema renders the cornea cloudy because the fibrils become more separated. Descemet’s membrane (#4 in Figure) which closely resembles the lens capsule, is a true PAS-positive membrane. Produced by the endothelium, the membrane is thin in infancy, increases in thickness to ~ 5 μ in childhood, and then to ~ 8 to 10 μ adulthood. What is the structure of the corneal endothelium? The endothelial cells lie on the posterior surface of the cornea and form the anterior boundary of the anterior aqueous chamber as a single layer (~ 5 to 6 μ thick) of flattened hexagonally arranged cells. What is the function of the corneal endothelium? Endothelial cells possess numerous mitochondria, are linked together by both desmosomal and occluding junctions, and pump fluid from the corneal stroma. This thereby prevents excessive hydration of the extracellular matrix, which would result in opacification of the cornea as the separation between lamellae exceeds ½ of a wavelength.